What do you say to a mother or father who recently lost a child in a terrible car accident? What do you say to someone who lost their best friend two weeks ago in the Iraq War? What do you say to a young person whose father or mother or spouse recently died of cancer or a heart attack while in the prime of their life? What do you say to a parent whose child committed suicide? My brothers and sisters, these questions I just asked all involve situations of tragic death. Every death of someone we love is sad, but some situations of death (like the ones in the 4 questions I just mentioned) have the added dimension of being tragedies. We usually say, “I’m sorry” in such circumstances, and that’s okay. We should say that we’re sorry and offer our sincere condolences to all those who are grieving deeply over the loss of a loved one. What can we do to ease the pain and confusion these men and women are experiencing as they struggle to make sense of something that on the surface appears to be senseless? Well, the bad news is that we can never take all the pain away, no matter how hard we try. Even if we do and say all the “right things,” the person who’s dealing with the tragedy will still have to face a cross of suffering. We might wish that we could wave a magic wand and make everything better, but we can’t. Which is not to say that we’re helpless and can’t do anything! We can’t make everything perfect for them—that’s true; but it is possible for us to be instruments that God uses to help them bear their cross more effectively and experience some inner healing in their lives. That much is within our power. Based on my 23 years of helping people face tragedies in their lives as an ordained priest, I would advise “the Three P Approach” in these situations. The “Three Ps” stand for presence, perspective and prayer. When you’re trying to help a friend cope with a tragic death, take this “Three P Approach” and I believe you’ll help them as much as you can. The first “P” there stands for presence—your presence. That is so important for those who are grieving. And this is precisely where many people fail. They sometimes stay away from those who have recently experienced a tragic death, because they feel awkward and don’t know what to say. Well, join the club, because I don’t always know what to say, either. But I go to these families, because I know that my being there is important to them and gives them support—even more than my words do! In fact, if you surveyed all the people I’ve ministered to in the midst of tragedy and said to them, “What did Fr. Ray say to you when he came to your house—or to the hospital—or to the nursing home—after your loved one died?” I’m confident that 95% of them couldn’t tell you anything I said! But they’ll remember that I was there! They’ll remember that I was there to be with them in one of the most difficult moments of their lives. And they’ll remember that you were there. You really don’t have to say anything—at least initially. In fact, sometimes it’s better when you don’t say anything. My father died of cancer when I was 14. For me, it was a terrible tragedy—he was only 46-years-old. That night my good friend Frank Chianese came over. He spent the night at our house. Now I couldn’t tell you one single thing that Frank said to me when he was there that night of September 10, 1971. But I definitely DO remember that he was there. Obviously, at that point his presence was much more important to me than his words were. Notice that Jesus Christ was always with people in the midst of their suffering. Today’s gospel story is just one example of Jesus being present to people in pain. That’s an example we should all strive to follow. Of course, eventually words do become important—usually long after the funeral is over. Here we have to be careful not to become preachy or to oversimplify matters, because if we do we will probably come across as harsh and insensitive. But speak we should—gently and respectfully doing our best to help the hurting person find the right perspective (this is the second P of the Three P Approach). Today’s first reading can be a big help in this regard. In fact, I often refer to this passage of Scripture at the funeral Masses of those who have died in tragic circumstances. Let’s face it, when their loved ones die tragically, many people tend to blame God, as if God were “the Dealer of Death”! But that’s the wrong perspective to have, because it’s just not true. God is (as we say in the Nicene Creed every Sunday) “the Lord and giver of life”; he’s not the Dealer of Death! Through words like these, spoken always in gentleness and love, we need to do our best to help victims of tragedy find the right perspective on God and on their situation. We need to help them understand that God is their friend, not their enemy—and that it’s in him (and only in him) that they have hope of seeing their deceased loved one again. Which brings us to the last P of the Three P Approach: Prayer. Presence and perspective are both important and necessary—but prayer is the source of the power that makes those first two “Ps” effective. The Mass, of course, is the most powerful prayer of all. This means that it’s appropriate to have Masses said, not only for those who have died, but also for those who are still alive and grieving. Or, at the very least, we should remember them when we’re here at Mass—and especially when we go back to our pews to pray after Communion. Presence, perspective, prayer: the Three P Approach to situations of tragic death. Now that we all know this approach, I would say that God expects us to put it into practice to the best of our ability. He will be counting on us—and so will many of our suffering friends. Once again we joined our brothers and sisters from Immaculate Conception Parish for a Eucharistic Procession on the Feast of Corpus Christi. It rained heavily in the early morning, but the Lord cleared the skies by the time the event began just after 12 noon. Or, to put it another way, creation itself points to the existence and the activity of a Creator. If you’re dialoguing with a Jew or a Muslim or someone with a similar view of God, you might find yourself forced to explain and defend this dogma of the Blessed Trinity to them—since Jews and Muslims don’t believe in the divinity of Jesus or the unique divine Personhood of the Holy Spirit. But it’s much more likely that you will find yourself forced to defend something else in public these days: the very existence of God himself—in spite of all the evidence in creation that I spoke about a few minutes ago. That’s because, as many of you already know, atheism is rapidly growing in popularity. Sad to say, but in certain segments of our society right now, it’s highly fashionable to say that you don’t believe in God—any god. As Catholic Christians, we need to be prepared for this kind of challenge to our faith, since it could come at any time—even from people we know who used to be believers. To help you in this regard, let me share with you now my 5 questions for an atheist. There are others you could ask, I’m sure; these are just my personal 5. I share them with you because I think for too long we Christians have been on the defensive when it comes to the issue of God’s existence—and we shouldn’t be. If anything, we should be on the offensive, challenging the presuppositions—the unreasonable presuppositions—of those who don’t believe. Many atheists say they put their trust in “science,” not faith—as if people who have religious faith can’t be great scientists. 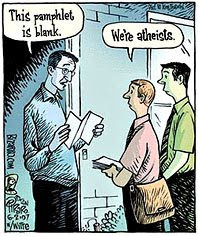 But the fact of the matter is, atheists have faith just like we do! And that’s the first point we should make when dialoguing with them. We simply have faith in different things: we have faith that there is a God; they have faith that there isn’t. Then we need to challenge them on the ideas that stand behind their faith, just like they challenge us on the ideas that stand behind ours. That’s one of the purposes of these 5 questions. So here they are (in no particular order) . . . Question #1: If God does not exist, then why should I respect you? If you are not created in God’s image and likeness; if you do not have an immortal soul; if you are no more valuable than a chicken or a mosquito, then why should I be concerned about you and your well-being? We kill chickens to use them for food—so why shouldn’t I “use” you to achieve whatever goals I want to achieve in my life? We kill mosquitoes because they annoy us—so why is it wrong for me to mistreat you if you annoy me? Question #3: If there is no God, then why was Hitler wrong? If there is no God, then morality is totally subjective. There is no ultimate authority for me except me! So why was Hitler wrong? He was simply acting on the principles of his own, personal morality. And who are we to impose our morality on him? You see, Dostoevsky was right: If God does not exist, EVERYTHING is permissible—including the grotesque, immoral activity of someone like Adolf Hitler. Question #4: If there is no God, and only matter exists, then why am I able to have images in my brain? In other words, explain my thoughts to me. I have an image of my car in my brain right now. But if my favorite brain surgeon, Dr. Martin Bednar, cut my thick skull open later today he would not find a little Toyota Camry lodged somewhere between my ears! So where is it? I know it’s there, but it definitely is not there physically. My point here is that our thoughts are not material. And while that fact doesn’t prove the existence of God in and of itself, it does point us to another dimension of reality—the spiritual dimension. Which brings us to question #5, which I think is the most challenging of all: Will you please explain to me how something can come from nothing? Matter exists; I exist; the world exists—and all of this constitutes “something”. As a religious believer, I say that this “something” came from something else—really Someone else—namely, God. But you say that God doesn’t exist. Okay, then where did this “something” come from? I’ve never seen something—anything—come from nothing. Yet, that’s what you believe as an atheist about creation. And don’t say you believe in the Big Bang Theory of the creation of the universe; that won’t solve the problem for you. The Big Bang says that 12-14 billion years ago the universe as we know it expanded from a tiny speck of matter after a huge cosmic explosion. Fine. So where did that “tiny speck of matter” come from? If that speck was like a bomb, then who or what made it? And who or what lit the fuse? And who or what designed the blueprint for the explosion? Did it come from nothing? If there is no God, then that’s what you must believe! But how does something come from nothing? Where is your scientific evidence that such a thing could—and actually did—happen? So there they are: my five questions for an atheist. They probably won’t convince him right away that there is a God who made him and the universe, but they’ll hopefully get him to start questioning his atheistic faith, and the flimsy presuppositions which stand behind that faith. And that just might get him on the road to belief: belief in the one, true God--and eventually belief in the Blessed Trinity.